Today was supposed to be an easy day. Drop the boat in the water, move some stuff on the boat and get out of the hotel. 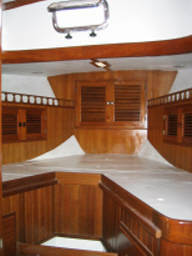 On the good side, all the painting and hull repair work got completed. On the bad side, the bow sprit platform was more damaged than I thought. The tab for fixing this: ugly! Shurtz ended up removing part of the old sprit and we ended up splashing her in the water. Yeah! Now we have something that resembles a boat. After a good nights sleep we were ready to start tackling the boat. First thing that I got around to really noticing was that the pulpit was bent when the mast was pulled. One of the standing rigging wires snagged a lifeline and torqued the front pulpit. Drag. The guys at Shurtz Marine did a most excellent job of pulling Kalliope together in spite of the fact that Kathy and I were still basket cases from the previous job. Reinstall Dodger, Gallows, Solar panels, etc. Clean up the Anchors. Shurtz let me a descaler to remove some of the bigger nastier rust particles ... I really thought that one of the anchors was a goner, but it seems like it can be recovered. Note to self: don't forget ear protection when using one of these guys. I felt like I just got back from a U2 concert. Trier is a very sick kitty. He did not have a good night and woke up at about 4 am with some breathing problems. The next morning we call our vet and she give us some hints. She thinks it might be the medication as well and we give him some meds. By that evening he is doing much better, he is alert and starting to walk around. In the meantime we arrive in Olympia, Washington in the rain. The last couple of days have been hectic trying to get the house closed up for the summer. Somehow we have managed to everything more or less packed up for the drive out to Washington and the house is in reasonable shape. We have a house sitter for the summer and he came by Saturday to help mow the lawn and help pack up some items in the car. The plan is to be away for three months this summer. Three months seems like a damn long time. As an added complication we have a sick kitty, Trier, that we have been taking care of. A couple of years ago he started having some kidney problems. Our vet figured out a regime that stabilized him and he was doing pretty well for the last couple of years. Then in January he started getting some lumps on his back. It was the dreaded C work. Many vets think that this type of cancer is related to the vaccination for feline leukemia. You might want to check into the vaccination before you have your pet poisoned. Trier has been a damn good cat over the years and is game for about anything as long as it involves sitting on our laps. We've taking him sailing and the heeling boat just doesn't faze him. He'll come up in the cockpit and just hang out. It is Sunday morning, 10 am, we are ready to hit the road. Really we are. Our boat is in Washington. Trier seems to be doing a bit better. Everything is ready ... except where is our other stupid cat, Belini. She is not to be found. We look 4 hours straight for her. We know she is in the house ... at least we are pretty sure she it .... she couldn't have got out could she. Maybe she is in the Garage. Okay, it is 4 pm and we really have to go. Our house sitter Dan will take care of he until we can bring her out next week. We hit the road. Trier is tired but gets some major lap time so he is mostly a happy camper on the drive out. An hour after we leave, Belini comes out of hiding. She was somewhere in the house!? This is the big day. We are loading her up and shipping her out. Again I get up absurdly early to put the final touches on everything and motor over to the yard. The trucker is there, everything is ready ... but, but my neighbor down the dock decided that she wanted to turn her boat into an experimental submarine. 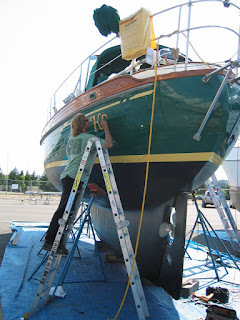 When I get to the yard her old wooden boat is sitting on the travel lift, keel sagging and water dripping out of the hull. It takes about two hours for them to deal with her and then splash another boat and then our turn. A little lifting, a little this, a little that, and viola one Tayana 37 packed up and ready to go. The trucker left about 1:30pm on Wednesday. In theory she could have been ready to be picked up on Saturday. Of course, nothing is opened on Saturday and this is Memorial day weekend, so we are going to pick her up next Tuesday. Now it is time to jump on a plane (not again!). Fly back to Colorado and close up the house for the summer. I got three days before we need to leave. So, I managed to make it to San Diego. As an added bonus my rental car company (Enterprise) closed before I could get my car. So I spent another half an hour digging around for a rental. I managed to pick up a Jeep Wrangler (Drives like a pig on the highway, but it was a convertible). 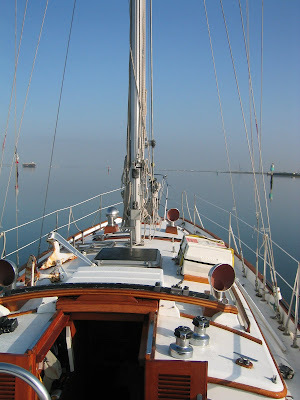 The next morning, Monday, I woke bright and early and took Kalliope over to South Bay Boat yard to get the mast yanked. This was the first time that I cast off the dock lines and pulled her out of the slip without any help (I guess my neighbors didn't feel like getting up at 7am!). As I was pulling out I was thinking about my deductible, but the wind was light and the gods were merciful, we exited the slip without further incident. in a closet, and under a settee. As the crane was suspending the mast (at $150/hr), I am digging around trying to find all of the connections. I got em loose with only one stupidly cut wire. Now our baby, Kalliope, is a motor boat. The rest of the day I spent stowing things so they would not chew holes in the boat on I-5 and removing spreaders and other mast paraphernalia. about 3:30pm, bubble wrap up some gear, a nice dinner and then early to bed. traveling since 11:30am this morning and should be on the boat sipping a beer. to the lawyer inspired wisdom, "Caution, moving walkway coming to and end. Please watch your step, thank you." I wish it would come to an end. forms for the SSB are a bit intense; however, I found a nifty guide at http://www.shakespeare-marine.com/new-fcc-license-steps/. The license should show up in a couple of weeks.